Samsung Galaxy range of smart phones and notebooks and tablets have been a huge hit all over the world and now the praise worthy brand has launched its up to date new range of connected cameras. The Samsung Galaxy camera combines a point-and-shoot camera and social networking together. It is a modern camera which totally relates to your need for all time updating and sharing. The funny thing is that the market of compact cameras was hit by the wonderful phone-cameras people used to get in any Samsung smart phones. Now Samsung itself has decided to market their own new age cameras which have brought a real revolution in the world of technology. Samsung has successfully collaborated different genres of technology to finally give its lovers the ultimate connected camera. 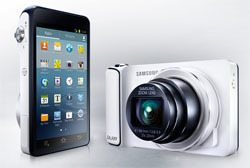 The Samsung Galaxy Camera comes in a classy vanilla ice-creamy white color and looks absolutely delicious. It is very compact and has a solid built. The camera is a 16 megapixel one with a 4.8 inch 1280x720 pixel touch screen display which is just humongous and good for both indoor and outdoor shoots. Samsung Galaxy Camera uses a 21x zoom lens on its front side which powerfully captures every little detail of the image. The Samsung Galaxy note has reincarnated the point and shoot cameras and taken care of all the demands of the young generation. At 70.8x128.7x19.1 mm all around the Samsung Galaxy Camera is not too hefty yet it is advisable to carry it in a separate pouch rather than in your jeans pocket. The Samsung Galaxy Camera is sure to get you noticed and is quite conspicuous weighing about 300 gm. The Samsung Galaxy Camera is certainly a bit heavier than the smart phones but still it is easy to use anywhere and anytime. It provides a good grip so you can take better pictures with it. What are the Features and Specialties of the Samsung Galaxy Camera? If photography has been your passion then the Samsung Galaxy camera can fulfill your photographic dreams. So what if you were never able to take pictures like the professional photographers before. With the Samsung Galaxy Camera you can choose from a variety of very minutely specific modes which will help you take amazing pro quality pictures. You can put your camera in action freeze mode to capture a high speed object super fast. Taking videos with the Samsung Galaxy camera is an incredible experience as it captures 120 frames every second and later plays it in slow motion so each frame can be closely observed and makes your memories come alive. The movie wizard in Samsung Galaxy camera makes wonderful movies out of your amateur videos. Editing your photos is a delightful adventure with the Samsung Galaxy camera as it has 65 superb editing features which help you control each aspect of the pictures. The Samsung Galaxy camera uses WI-FI and 3G connectivity so that you can download thousands of apps and upload your pictures instantaneously.